In line with the government's emphasis to upgrade the skill and technology level of local indus- tries, Far East-Levingston Ship- building Limited (FELS) has taken a significant step forward to enhance its operations. Services in Norway to operate the AUTOKON software system for ship design and production. PRIME computer that was re- cently installed in the shipyard. The investment of both the soft- ware and hardware system is over two million Singapore dollars. In addition, FELS has ordered a numerically controlled flame cut- ting machine from Messer Greis- heim in Germany to automate its plate cutting processes. This ma- chine will take the numerical out- puts produced by the AUTOKON system. CrilY"} Machines have saved ^ "Mr them almost % managersbiUion doUas can't be wrong. More than 2 million tons of fuel saved by all types of vessels. Machines. With them, high-speed underwater hull cleaning became a major factor in economic ship management. 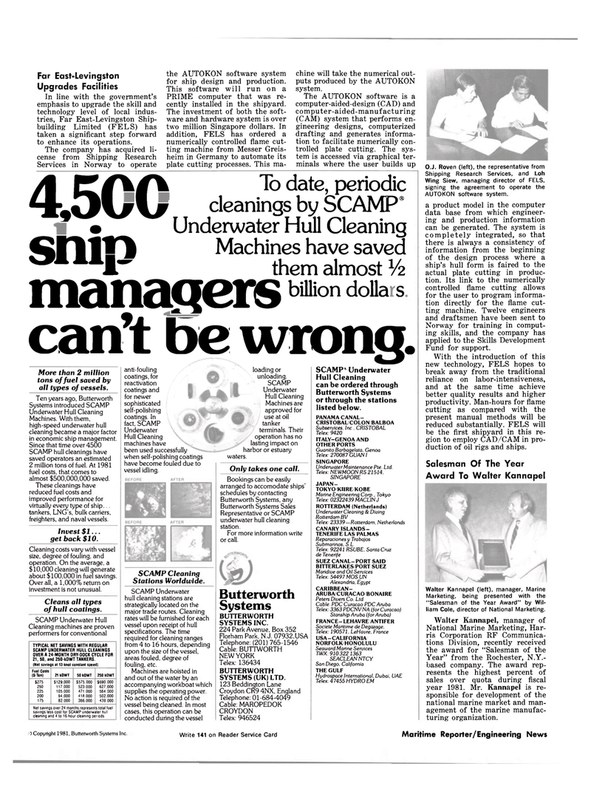 SCAMP hull cleanings have saved operators an estimated 2 million tons of fuel. At 1981 fuel costs, that comes to almost $500,000,000 saved. These cleanings have reduced fuel costs and improved performance for virtually every type of ship... tankers, LNG's, bulk carriers, freighters, and naval vessels. Invest $1... get back $10. Cleaning costs vary with vessel size, degree of fouling, and operation. On the average, a $10,000 cleaning will generate about $100,000 in fuel savings. Overall, a 1,000% return on investment is not unusual. Cleans all types of hull coatings. Hull Cleaning machines have been used successfully when self-polishing coatings have become fouled due to vessel idling. SCAMP Underwater hull cleaning stations are strategically located on the major trade routes. Cleaning rates will be furnished for each vessel upon receipt of hull specifications. The time required for cleaning ranges from 4 to 16 hours, depending upon the size of the vessel, areas fouled, degree of fouling, etc. Machines are hoisted in and out of the water by an accompanying workboat which supplies the operating power. Machines are approved for use at oil tanker terminals. Their operation has no lasting impact on harbor or estuary waters. Representative or SCAMP underwater hull cleaning station. For more information write or call. Butterworth Systems or through the stations listed below. With the introduction of this new technology, FELS hopes to break away from the traditional reliance on labor-intensiveness, and at the same time achieve better quality results and higher productivity. Man-hours for flame cutting as compared with the present manual methods will be reduced substantially. FELS will be the first shipyard in this re- gion to employ CAD/CAM in pro- duction of oil rigs and ships. Marketing, being presented with the "Salesman of the Year Award" by Wil- liam Cole, director of National Marketing.